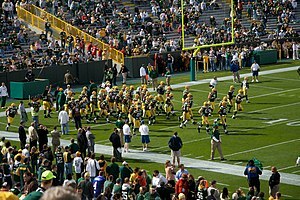 Down 21-10 to Atlanta at halftime, things did not look good for the Green Bay Packers on Sunday. Fortunately, the defense held the Falcons scoreless in the second half and the Pack came away with a 22-21 win. With the win on Sunday, the Packers are now 54-1 since 1990 in games when they hold their opponents scoreless in the second half. The last time the Pack lost a game where they held their opponents to zero points in the second half was September 25, 2005. The Tampa Bay Bucs won that game 17-16. Since that contest, Green Bay has won 18 straight games when they pitch a shutout in the second half. If we look at the numbers of all NFL teams when they hold opponents scoreless in the second half since 2000, teams are 681-100 (a .872 winning percentage). The Minnesota Vikings have played in only six of those games, but they have won all of them, giving them a 1.000 winning percentage. The Packers are 31-1 (.969 winning percentage) in games when they hold opponents scoreless in the second half since 2000, the second best winning percentage in the league. Going back to 1966, the start of the Super Bowl era, the Packers are 88-14-3 in such games (a .852 winning percentage). Let’s take it a step further… the Packers surrendered 21 points to the Falcons in the first half of last Sunday’s game. It was only the sixth time since 1966 that the Packers have won a game where they gave up 20 or more points in the first half and then allowed zero in the second half. Their other win was in 1982 against the Rams. The Rams on September 12, 1982 were leading 23-0 at halftime of that contest; the Packers scored 35 unanswered points in the second half in route to a 35-23 win. Here’s a look at the six games (since 1966) where the Pack allowed 20-plus points in the first half and allowed zero in the second half. December 8, 2013 vs. Atlanta: Pack losing 21-10 at halftime; they won the game 22-21. December 10, 1989 vs. Kansas City: Pack losing 21-3 at halftime; they lost the game 21-3. September 18, 1988 vs. Miami: Pack losing 24-14 at halftime; they lost game 24-17. September 14, 1986 vs. New Orleans: Pack losing 24-3 at halftime; they lost game 24-10. September 12, 1984 vs. Los Angeles Rams: Pack losing 23-0 at halftime; they won game 35-23. December 7, 1975 vs. Minnesota: Pack losing 24-3 at halftime; they lost game 24-3. Note: The two games above that they won were both played in Green bay; the other four games were played on the road.